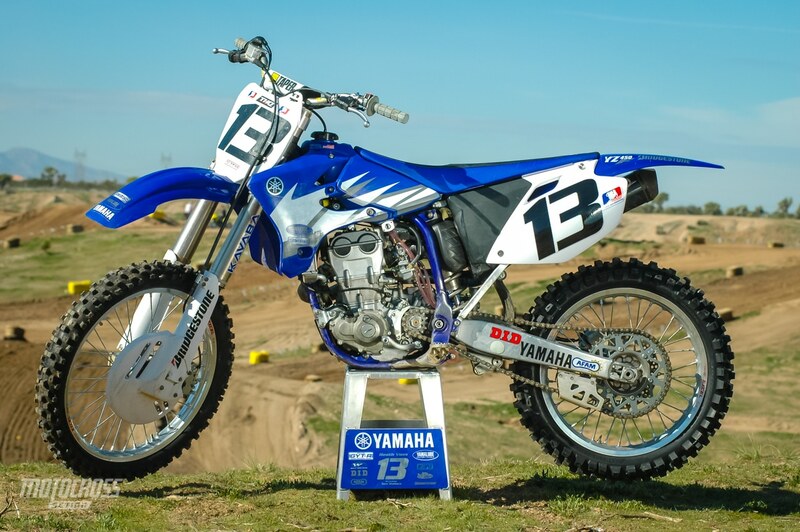 Heath Voss’ World Championship winning 2004 Yamaha YZ450F. Article from the 2004 August issue of MXA. I wonder how much coverage the AMA insurance gives me? That was the first thing that popped into my mind, apart from the flashing stars and ringing sounds. Why did I care about insurance coverage? Because as a SoCal boy I never have to enter any AMA races. SoCal is a “No AMA Zone,” hence I never paid any attention to my AMA license. It was $39 that I spent every year to race amateur day at a few 125/250 Nationals (Millville, Unadilla, Glen Helen and Hangtown), so I wasn’t exactly an expert on all the perks that come for four sawbucks. 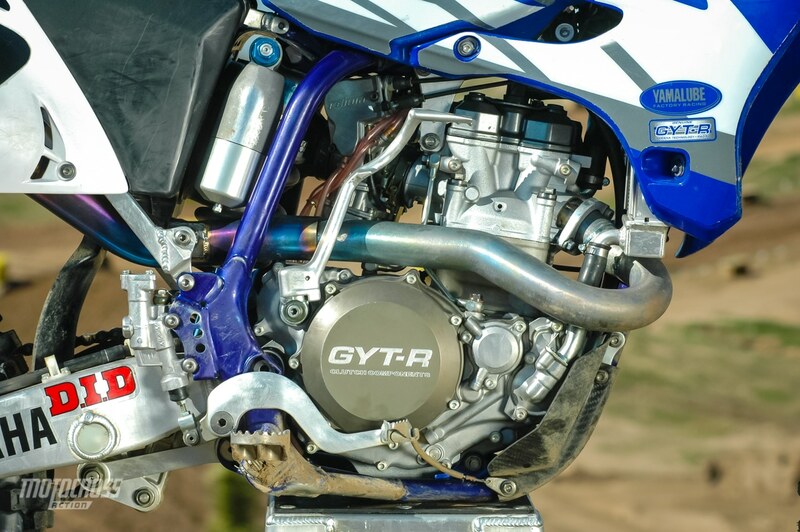 The factory YZ450F power plant. But, before I continue, let me back up to a few days before the worst first-turn pileup of my life. AFTER SPENDING THE BETTER PART OF A HALF HOUR GOING INTO INTRICATE DETAIL ABOUT EVERY FACET OF THEIR YZ450F (WHICH AT THE TIME SEEMED EXCEPTIONALLY LONG, SEEING AS HOW I HAD BEEN LOOKING FOR A ONE- OR TWO-WORD ANSWER), WALLACE AND I HAD A SIMULTANEOUS BRAINSTORM. The whole story began at the Las Vegas Supercross. Heath Voss had just wrapped up the THQ World Supercross crown, handing Yamaha both the much coveted AMA crown (thanks to Chad Reed) and THQ World Supercross (with Voss at the throttle). At Vegas I was hanging around the Mach 1 pits, congratulating Heath Voss, nabbing food out of their ice chest and quizzing mechanic Tom Wallace on how they tamed Yamaha’s beast. After spending the better part of a half hour going into intricate detail about every facet of their YZ450F (which at the time seemed exceptionally long, seeing as how I was looking for a one- or two-word answer), Wallace and I had a simultaneous brainstorm. With the Supercross series and the Nationals about to start, why ask questions—why not just race Heath Voss’ World Supercross-winning YZ450F. 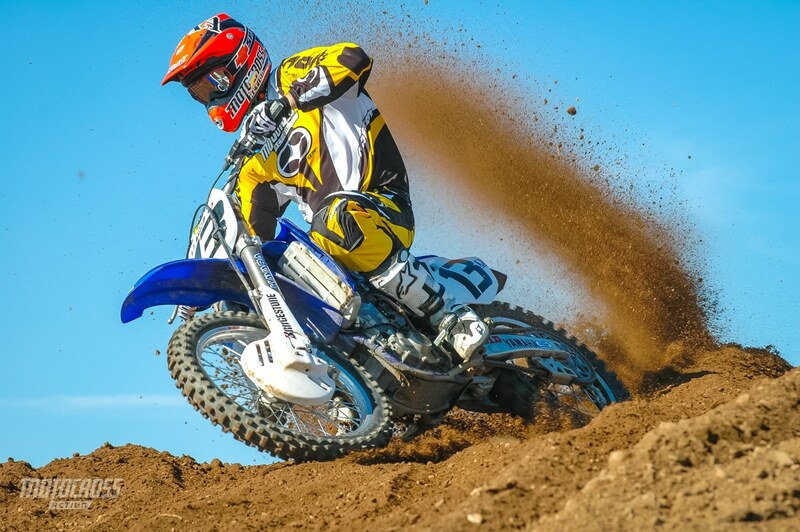 MXA test rider putting Heath’s bike through the paces. It started off innocently. At first, the test was going to be at Glen Helen at the Prequel warm-up race. Whoa! There wasn’t enough time. The back-up plan was to take the bike to Hangtown and ride it on a special Thursday test session that the Hangtown folks had arranged. An official Team Yamaha test session interfered with that. Finally, it was decided that the MXA wrecking crew, me in particular, would race Heath’s race bike at Friday’s Amateur race (with 39 other crazy 250 intermediates). CAUGHT SLEEPING AT THE GATE, I DECIDED TO USE ALL 59 HORSEPOWER OF VOSS’S YAMAHA TO GET TO THE FRONT—EVEN THOUGH I WAS IN THE BACK. BIG MISTAKE. YOU DON’T WIN THE RACE IN THE FIRST TURN, BUT YOU DO LOSE IT. It was a great day. I hammered Voss’ big YZ-F through several practice sessions, and luckily had ridden Tim Ferry’s version of this bike less than a year ago. It looked like all was right with the world. Or, it would have been, if I had made it through the first turn. Have you ever had the feeling that you were going to crash a few seconds before it happens. That was my scenario. Caught sleeping at the gate, I decided to use all 59 horsepower of Voss’s Yamaha to get to the front—even though I was in the back. Big mistake. You don’t win the race in the first turn, but you do lose it. I came from the back to the front and went back to the back just as fast. So what can I tell you about Heath Voss’ bike? I can tell you that my knee is the size of a grapefruit, the bike was fast in a straight line and I’m glad I learned a lot about it in practice—because my race only lasted the length of the start straight. 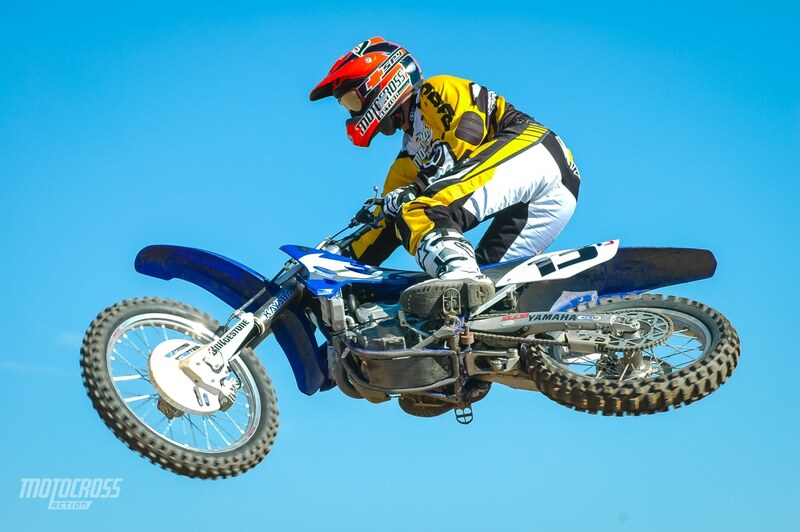 Heath Voss has a Yamaha factory ride. At the beginning of the 2004 season he had the works engine with last year’s suspension. By the end of the 2004 Supercross series, Heath had parts of the works engine and the latest and greatest suspension Kayaba has to offer. Heath bike had factory Kayaba forks on it. 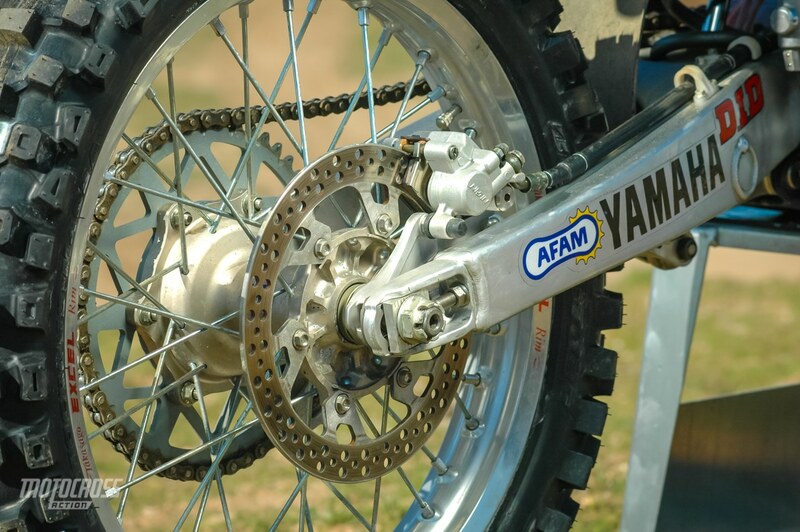 THE THREE BIG-NAME SHOES—REED, FERRY AND VUILLEMIN (AND EVEN LUSK, IF YOU WANT TO COUNT HIM)—ALL CHOSE YZ250 TWO-STROKES . HEATH, ON THE OTHER HAND, PLANNED TO RIDE THE BEAST ALL YEAR. Confused? You shouldn’t be. 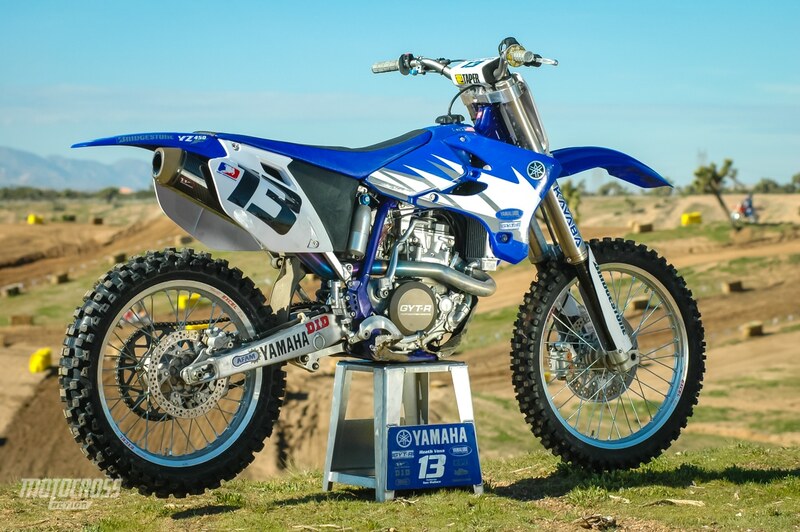 At the start of the Supercross series Voss was Yamaha’s lone YZ450F rider. The three big-name shoes—Reed, Ferry and Vuillemin (and even Lusk, if you want to count him)— all chose YZ250 two-strokes for Supercross and YZ450s for the 250 Nationals. Heath, on the other hand, planned to ride the beast all year. Tom Wallace delivered Heath Voss’ YZ450F to me shortly before Hangtown practice in the exact condition that it left its Glen Helen’s test session the day before. It still had Glen Helen dirt under the fenders, which to my mind was a good thing because it meant I was truly riding Heath Voss’ race bike, not some shop bike that had Heath’s graphics and a good set of suspension on it. I was even more amazed when Heath raced the bike on Sunday at Hangtown with the battle scars that I had put on the front fork guards still visible. Heath’s fork guards are 2005 parts and there weren’t any spares. I know what you’re thinking: how could a factory- backed race team let an MXA test rider race the World Supercross Champion’s bike one day before the AMA Nationals were to start? The answer is simple. First, I don’t have a rep as a crasher. Second, Tom Wallace and Heath thought that a shakedown run on Friday would be a good idea. Third, Heath didn’t even mind the battle scars; he thought they gave the bike character. THE ONLY WORDS OF WISDOM TOM WALLACE GAVE ME BEFORE I HEADED OFF FOR PRACTICE AT HANGTOWN WAS TO NOT LET THE BIKE SIT AND IDLE. 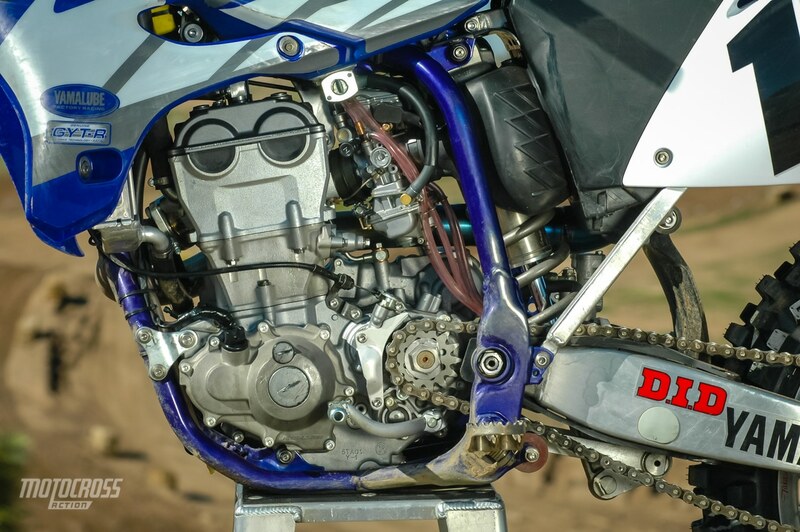 IT GETS HOT FAST, AND EVEN WITH THE FACTORY’S 1.8 RADIATOR CAP, THE YZ450F HAS A TENDENCY TO START PUKING COOLANT OUT THE OVERFLOW. Heath Voss did change one part of the bike between my crash on Saturday and his race on Sunday. When Voss rode the bike in the National practice session, Team Yamaha gave him a new head to try. Voss preferred the new head to the old one (the one that I pile-drove into the ground). Heath runs a YMUS engine, works transmission (with completely different ratios), White Brother’s Carbon Factory Exhaust, iCat ignition, Hinson clutch, Wiseco high-compression piston, UFO plastic, Pro Taper handlebars, Tag Metals grips, Sunstar sprockets, GYT-R footpegs, Arc Levers, Ferodo brake pads and One Industries graphics (Mach 1 version). 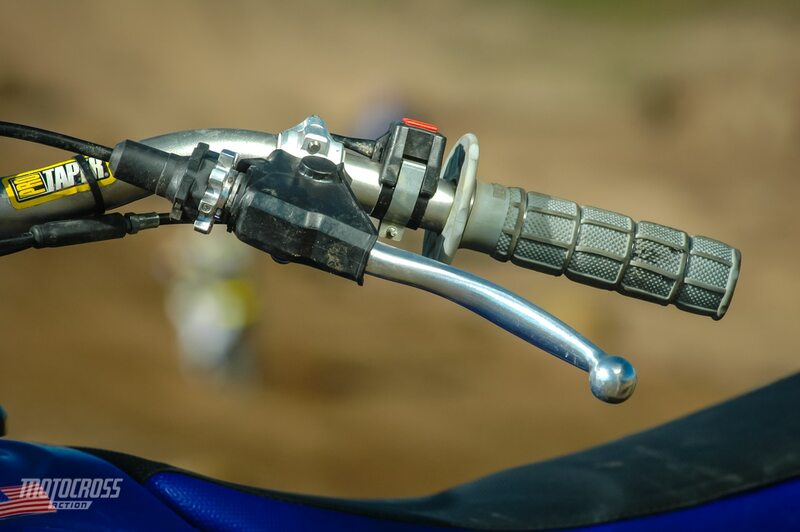 The carburetor, air boot and airbox on Voss’ YZ450F are from the production 2005 YZ450F. The only words of wisdom Tom Wallace gave me before I headed off for practice at Hangtown was to not let the bike sit and idle. 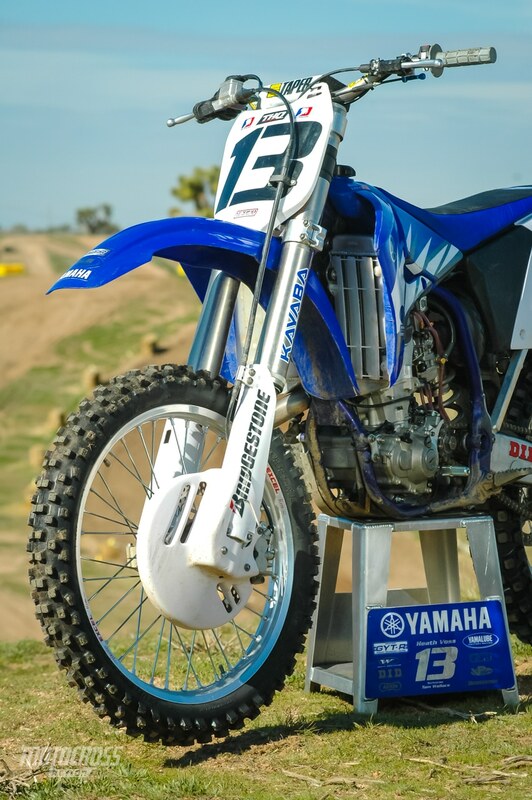 It gets hot fast, and even with the factory’s 1.8 radiator cap, the YZ450F has a tendency to start puking coolant out the overflow. I would have had a hard time heeding his instructions had the bike been a bear to start, but since Heath’s bike starts on the first kick I was more than happy to oblige Wallace’s only request. I actually got a good chuckle out of the whole thing as I waited for my practice and the guy next to me let his YZ-F idle to the point of creating a small pond under his engine. It only took me one straight to recognize the most amazing aspects of Voss’ engine. Horsepower! Tons of it! With about 59 ponies at my disposal, no obstacle seemed impossible. Big doubles, no troubles. Deep dirt only lengthened the smile on my face. The longer the straights, the better. I’ve ridden big horsepower machines before and normally they’re hard to handle. Not so with the Vossmobile. Team Yamaha’s main objective was to tame the beast. The strategy goes as far back as the Maico 501—give the bike major horsepower, but make it usable. UNFORTUNATELY, OR FORTUNATELY WHICH IS HOW I LOOKED AT IT WITH THE WORKS KAYABA SUSPENSION, I COULDN’T FIND A BUMP ON THE TRACK. THEY WERE THERE, BUT I DIDN’T FEEL THEM. With the engine under control, it was time to hit a few bumps. Hangtown was chuck-hole heaven. Unfortunately—or fortunately, which is how I looked at it—with the works Kayaba suspension, I couldn’t find a bump on the track. They were there, but I didn’t feel them. What did it take to get the forks and shock this way? A lot of money. Works suspension isn’t cheap and Yamaha’s Kayaba works suspension looks even more expensive than usual. Add a works rear linkage to the mix and the combined experience of Jon Rosenthiel, Ross Maeda and Cory Nutter and you have amazing suspension. Last, but not least is the handling. The Yamaha YZ450F is a big bike; there’s no denying it. The bike feels long, and because the weight sits fairly high in the frame, the bike feels top heavy. Most four-stroke riders get used to the peccadillos of the weight, but Heath made a few changes. First, the stock 24mm offset triple clamps are replaced with 22.5mm offset triple clamps. Second, the races are offset to steepen the bike’s head angle. Third, the rear subframe is cut to lower the back of the bike. The result? As a complete package, Voss’ bike did everything we wanted it to. It turned easy, felt light in midair and was stable down the straights. Were the Mach 1 guys bummed that I crashed their works Yamaha? You bet. Imagine watching your pride and joy doing a demolition-derby imitation in the first turn. I’ll give Wallace, Voss and the boys credit: they did an extremely good job of hiding their anger. Luckily, I didn’t do a lot of damage. I scratched up the 2005 fork guards, broke the choke off the carb and left some chunks of cartilage on the triple clamps. All in all, it was fixable. My knee is fixable too—once I find out how much insurance coverage I have.